What bigger and better declaration of eternal love than a print devoted to the vastness of space, the universe and our place in it? 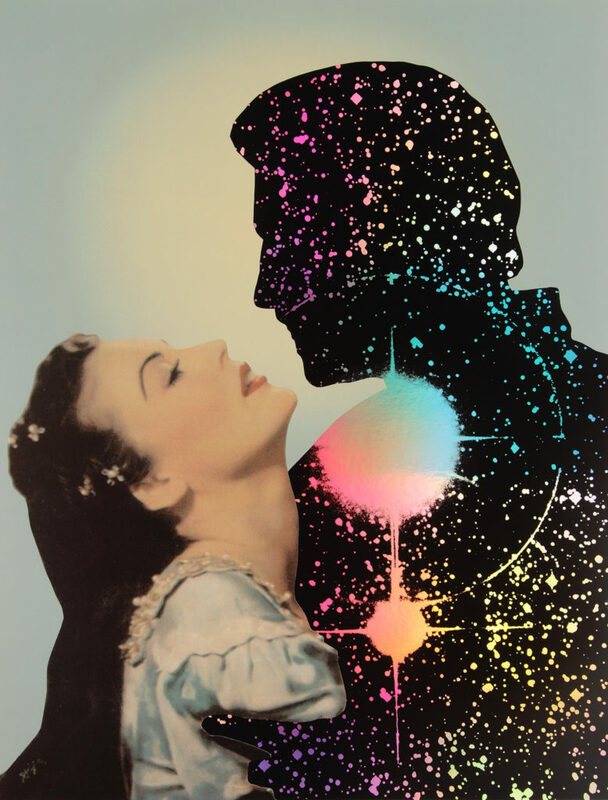 This limited edition silkscreen (£795/edition of 125) from collage star Joe Webb is titled after Antares, one of the largest known stars. Find it here. Love in linocut (£330; edition of 75) by Gail Brodholt. British printmaker Gail conjures the yearning and romance of travel in her richly-hued prints. Shop the print here. A tender embrace by moonlight in printmaker Corinna Button’s carborundum collagraph print (£320; edition of 30). Find it here. Film Noir-style lithograph (£495; edition of 10) transporting love on the Tube to bygone days, from painter and printmaker John Duffin. Find it here. Roses to last forever, in Vicky Oldfield’s limited edition collagraph and watercolour print (£245; edition of 20). Find it here. Inspired by ‘ukiyo’ (‘floating’ or ‘fleeting world’), which was the pleasure-seeking urban lifestyle of Edo-period Japan (1600-1867), this linocut (£120; edition of 100) by Mexican-born printmaker Jazmin Velasco borrows its graphic lines from traditional Japanese woodblocks. Historically, ‘ukiyo-e’ prints would depict scenes featuring geisha, kabuki actors, sumo wrestlers, samurai and prostitutes. See more here. Memories of giddy evenings spent whirling around the dance floor in this vibrant and beautiful Paul Cleden linocut (£300; edition of 30). Find it here. A wonderfully whimsical etching with chinecolle print from Trevor Price (£175; edition of 75). Shop here. Love in a gritty climate from the master of powerful, comic strip-style commentary. All is not what it seems in this limited edition etching (£220; edition of 100). Find it here. An ode to the glory of vinyl and the ultimate classic love track. What better than this screenprint from Martin Grover (£350; edition of 24)? Find it here. Love, any which way you put it, in Ealing-based artist Jess Wilson’s colourful screenprint (£395; edition of 45). Shop here.